I grew up close to the Zoo Skansen in Stockholm and spend a lot of time there during childhood. After selling my first budgerigars to a Zoo-shop, I started to work there in afternoons rather than doing my home work. As teenager I worked as sheepherd in Stockholm, and after working there and in Zoo-shops and farms I attended Zookeepers line at high-school. I wanted to work with exotic animals. The same autumn, 17 years old, I went to Sri Lanka four months, studying working elephants, during the practice. Now, as animal keeper since 45 years, I have worked from scorpions, aquarium fishes, birds and dogs, to sealions, hippos, giraffes and elephants. 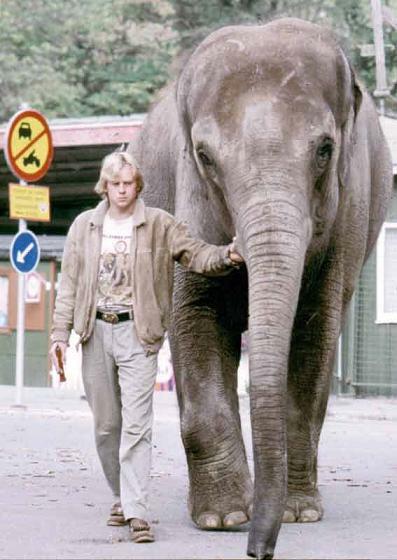 42 years as elephant keeper later, I am one of the few elephant consultants in europe, with experience from more than 70 elephants in 9 countries, from Sweden and Finland in the north, to Southafrica in the south. When I started using Internet in 1995, I didnt find any information about elephants, so I made my first website. It has changed over the years, and is to a certain amount developed by its visitors, since I had a lot of questions the first years, and a lot of feedback. The website has changed over those 24 years and a major renovation was done in october 2003 when I transfered the site into PHP and MySQL. I hope you like the website and found what you were looking for!